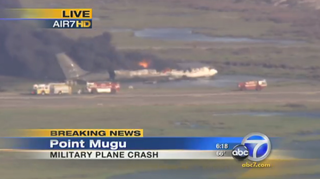 A civilian Boeing 707 tanker aircraft contracted by the Navy and loaded with 158,000 pounds of fuel crashed on takeoff at Point Mugu Wednesday, destroying the aircraft. All three crewmembers survived with only minor injuries. The NTSB is investigating.